Search engine friendly: People will locate your website more easily, when you update your blog at regular intervals with fresh, well written and keyword rich content. Google will list your site more frequently and the pages you put on web will appear in search results more rapidly. Easy way of communication: People who are interested in your business blogs and in what you have to say can subscribe to receive updates from your blog. So, every time you put a new article on your website blog, it gets automatically pushed out to all the readers. This way you are able to communicate directly with target customers. Brand building: A blog gives you a better chance to bring up your company in front of thousands of people. More customers will take notice of posts you put on your business blogs. Product Differentiation: You can tell from your blog to your potential customers about the differentiate product you offer. It’s an opportunity to mention your work, the things which sets you apart and how you are unique among your competitors. Social Media: Social bookmarking sites like digg, delicious and social networking sites like Facebook, Myspace are a good source to increase your website visitors, if you are able to make one of your blog articles viral on these sites. Manage your Reputation: A blog is a platform to answer any negative pitch your company is receiving. It is defiantly a better way to manage your online reputation. Inexpensive: A blog is simple and inexpensive to set up. 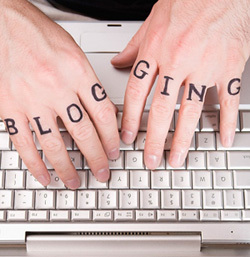 Moreover integrating your blog into the page of your business website costs very little. You have to spend very little on this most powerful marketing weapon just like you pay a salesperson for one day’s work. Track customers interests: Customers usually leaves comments on your posts, this enables you to gain insight into your customers. You can also get a sense of their interests from their comments and reaction on each post. Better positioning: Blogs are better way to position yourself in the competition. Position your company as an expert in your field, you will get more readers. Tell the world from your blog, that how professional are you in your work.